Read more as a member. We find the dry cargo space very interesting and believe that the trough was 1Q16. The company is recently restructured, in a sound liquidity position and well placed to take advantage of the ongoing cyclical upturn. We find the share very reasonably priced comparative to steeper valued peers such as GOGL or SBLK, and could be contemplating a rating upgrade if the share price continues to slide. We find the dry cargo space very interesting and believe that the trough was 1Q16. The share is attractively priced comparative to peers, but we deem its fleet to have strong industrial qualities which is less opportune in the current point of the cycle. Something that could spark the stagnant and peer-trailing share price into life is further corporate actions (accretive equity issuances & vessel acquisitions) in addition to increased focus from positive investment banker analysts. 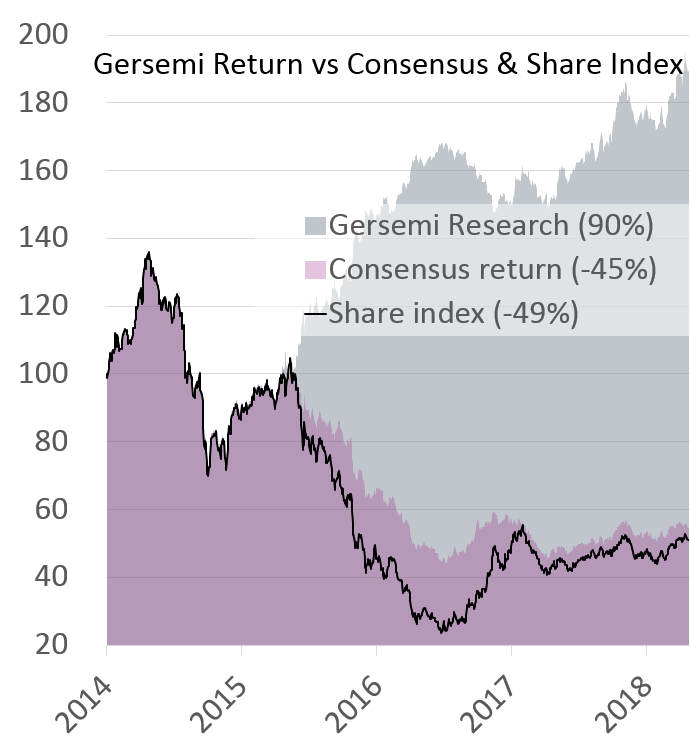 We do believe the share will outperform peers in the short to medium term, and suggest the hedged dry bulk investor to go long EGLE and short steeper valued peers such as GOGL or SBLK.